Happy Friday! I’m posting about a blanket, and it’s ridiculously hot outside, but maybe this can remind us of cooler weather? 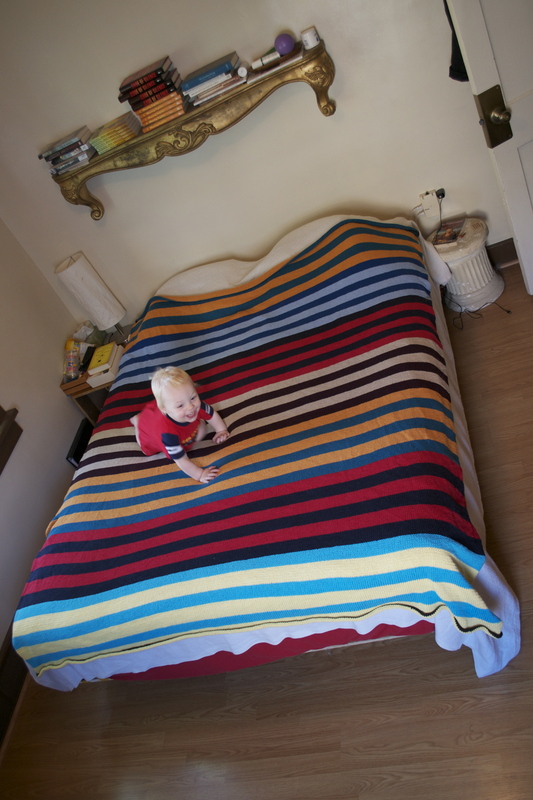 At long last, I finished the striped blanket I was working on (blogged earlier). Since it’s all in stockinette, it curls some, but putting it on a bed, combined with its own weight (cotton is soft, but it isn’t the lightest fiber around), counteracts that to a large degree. I knew the curling would happen, but I really wanted this blanket to be stockinette. The curling will be not that much of a problem — it will still function just fine for my purposes. I’m really, really happy with it. Here’s my Ravelry project page. 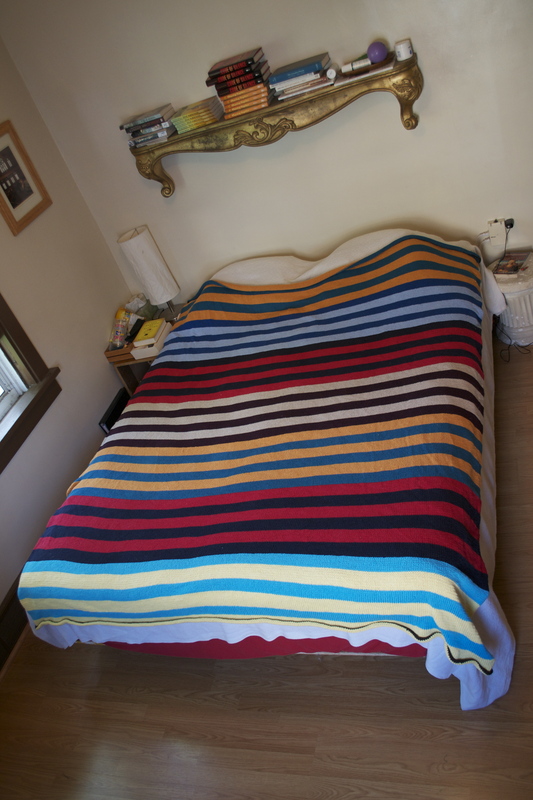 Yarn: I used all cotton yarn for this blanket, all reclaimed (unraveled) from old sweaters. As an aside, these photos also give you one view of our bedroom, the one I’m working on decorating (starting with crocheting a headboard). Clearly it’s nothing special now; I’m excited for what it will become, though. Please pay no attention to all the messy surfaces; I clearly didn’t stage the space for this photo! I just had to include this photo, too. Hm, maybe the tot helps provide scale? 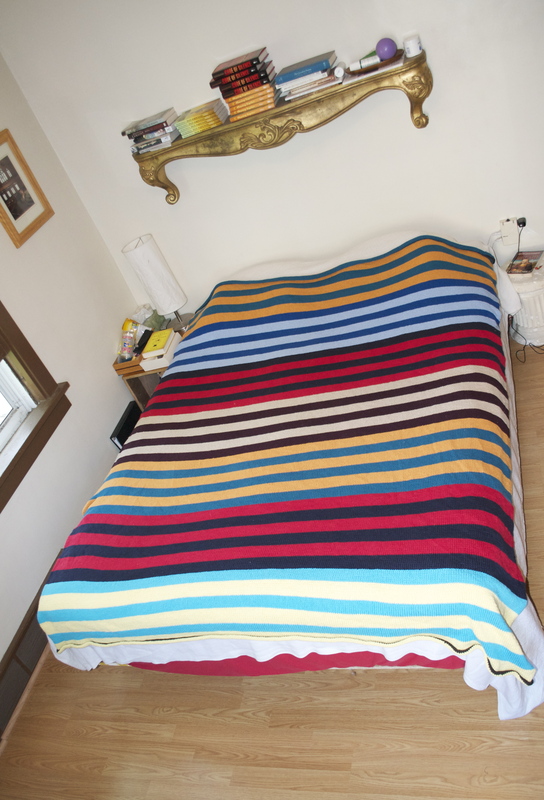 This entry was posted in knitting and tagged blankets, fiber arts, fiber arts friday, finished object friday, home, stripes. Bookmark the permalink. Awwww!!! What a CUTE photobomb!! Holy cow, that’s amazing! You must be the most patient and diligent person in the whole world to knit that much stockinette in cotton! Ha! I don’t think that’s the case, but I was really determined and I knew I’d love the finished object. Wow! I haven’t had the courage to make a really big blanket. Scared I would never finish it. This is beautiful. Love the colors and the stripes. wow it’s gorgeous! And knitting a blanket, respect! Awesome blanket! That is quite the accomplishment, I must say I am quite envious. A seems to really enjoy it! Thanks! I hope he’ll love it for years to come. Such a cool looking blanket! The stripes and colors make it so awesome. I absolutely love that it is knitted from reclaimed yarn, too. Your A. is adorable! There are so many sweaters in this blanket! I adore all of the colors! Only two months? That would have taken me forever. I like that you used cotton. What a beautiful blanket! It looks soft and comfy, too.